Whether the child is a preschooler or a high schooler, attention deficit hyperactivity disorder (ADHD) can present some significant behavioral challenges at home and at school. 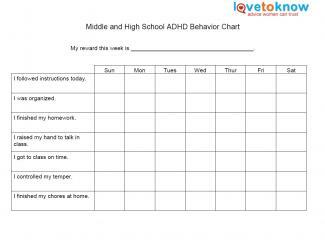 Recent research shows that behavior charts offer a great resource for kids, parents, and teachers managing the symptoms of ADHD. 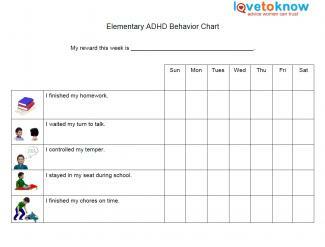 These free printable behavior charts for kids are designed specifically to target age-appropriate goals for students with ADHD. 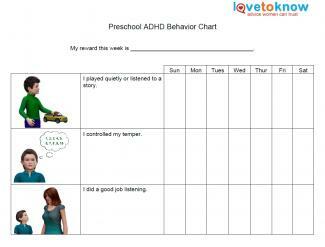 Print this behavior chart for preschoolers. For many children with ADHD, preschool offers the first opportunity for diagnosis. According to WebMD, the beginning of school routines, such as circle time, reading stories, and structured craft projects, sometimes highlight the learning differences and challenges faced by children with ADHD. Additionally, peer interactions and greater social demands may make it more difficult for children to control impulsive outbursts. If you need help downloading the printable behavior chart template, check out these helpful tips. "I played quietly or listened to a story." "I did a good job listening." Print out the chart in color. The pictures will help the child stay focused. Clearly label the child's reward. It may also help to include a picture of the reward. Be sure to set a goal for the number of stickers required to receive the reward. For each day of the week, give the child a sticker if he or she has demonstrated the desired behavior. Provide verbal praise too. At the end of the week, check whether the child has received the appropriate number of stickers. If the child has received enough stickers, present the goal. Print this elementary school behavior chart. When children with ADHD are in elementary school, they may exhibit a variety of ADHD symptoms, including difficulty attending and listening, frequently losing things, difficulty remaining seated or refraining from fidgeting, talking excessively and frequently interrupting other people, difficulty completing tasks, and problems controlling impulses. "I waited my turn to talk." "I stayed in my seat during school." "I finished my chores on time." Print out the free chart using a color printer. 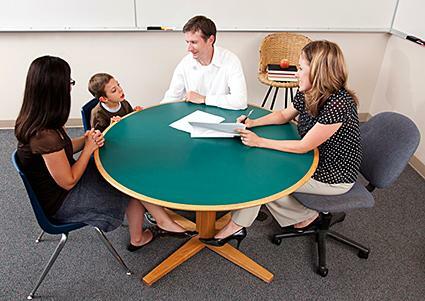 Discuss the reward with the child, and write it in the blank provided. Attach a photo or drawing of the reward for non-readers. Clearly communicate how many stickers the child will need to attain his or her goal. Reward the child with a sticker if he or she has demonstrated the desired behavior on a given day. Count up the stickers together at the end of the week. If the child has enough stickers, he or she receives the reward. If not, discuss how the behavior needs to change. Print this behavior chart for adolescents. The American Academy of Child and Adolescent Psychiatry reports that some children who were previously diagnosed with ADHD may no longer require treatment by late adolescence or adulthood. If they have not yet outgrown the diagnosis, these teens may show signs of disorganization, inattention, impulsiveness, and over activity. Additionally, some middle and high school students with ADHD struggle with controlling their tempers and behaving in an appropriate manner. At this age, kids are capable of more abstract thought than they are at earlier grade levels, so charts no longer need to include pictures. Additionally, these kids are nearing adulthood and are learning to handle greater expectations regarding their behavior. "I raised my hand to talk in class." "I got to class on time." "I finished my chores at home." Print out the free chart. You'll need one chart for each week. Discuss the reward with the teen, and write it in the blank provided. Clearly communicate how many check marks the student will need to attain his or her goal. At the end of each day, sit down with the student and assess whether he or she met the goals. If the teen met the goals, place a check mark or sticker in the box. Count up the stickers or check marks together at the end of the week. If the teen has enough stickers, he or she receives the reward. If not, discuss how the behavior needs to change for the next week. Keep it simple. A chart that is too wordy may be difficult for your child to follow. Decide on a reward. Choose a reward that is motivating. Keep it positive. For the greatest success, the goals on the behavior chart need to be phrased in a positive manner. Stay way from words like "doesn't" or "not." Be consistent. Consistency is the key to the success of using behavior charts. If you expect the child to follow through, you need to follow through as well. Expect some push-back. Keep in mind that your child may really test you when you first begin using the behavior charts. However, the positive nature of these charts will soon win out. Keep it age-appropriate. Make sure your expectations are reasonable and that you're using a chart that's appropriate for the child's developmental level. A study published by the Association for Behavior Analysis International tested the efficacy of behavior charts in managing disruptive activity in ADHD children in four classrooms. The results indicated that the charts offered a significant improvement over traditional behavior modification methods. According to a study published in the Journal of Applied Behavior Analysis, behavior charts can effectively extend the amount of time a child can pay attention in the classroom setting. Because these charts focus on the positive and are age-appropriate, children feel successful and encouraged. What's more, controlling challenging behaviors helps ADHD students improve social and family relationships, as well as academic performance.